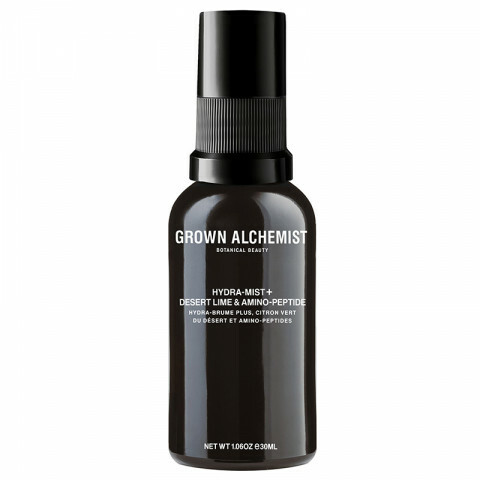 An advanced facial hydrating mist formulated with potent peptides, hyaluronic acid and antioxidants to visibly hydrate, soften, smooth, soothe and noticeably boost skin radiance reducing the visible signs of aging. Hyaluronic acid, Desert Lime and kelp extracts provide anti-aging flavonoids and antioxidants while providing lasting hydration. Hibiscus and Olive Leaf extracts rich in antioxidants moisturize, balance and noticeably soften and smooth facial skin. Pomegranate and Bilberry Leaf extracts visibly calm and soothe the skin. Sodium PCA and amino acids in the form of a protein peptide from wheat along with Vitamin C antioxidants from Bilberry Leaf extract provide visible improvement against environmental and oxidative damage while rejuvenating facial skin. the mist save my dry flakey skin and gives extra hydration..Lightweight, luxurious, perfect.